Silver Creek Park, near Harrison Hot Springs, B.C. Photograph depicts Silver Creek, near Harrison Hot Springs, British Columbia.Landscape shows a fast-moving creek flowing between treed banks; foothills rise to two mountain peaks with residual snow. The Lions and Capilano River, Vancouver B.C. Photograph depicts a fisherman holding a fish.Older man wearing hat, holding a fish in his left hand and a fishing rod in his right hand; man is crouched on rock beside river; trees in background. 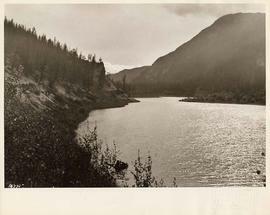 Photograph depicts the Fraser River at Hope, British Columbia. 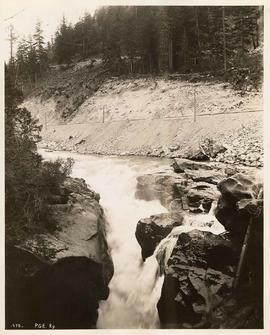 The photograph has alternatively been identified as Nimpkish Lake on Vancouver Island.Trees and top of guard rail in foreground; wide river below snow-capped, heavily forested mountains. Photograph depicts a river and trees.Bare trees border bend in river; snow-capped mountain visible in background through tree branches.